Due to recent changes to Google Wallet/Google Payments, Appmonger is no longer able to fetch app sales data in the same way that it always has. There is no officially supported mechanism by which this data can be obtained, therefore further development of Appmonger is unviable. Please see this blog post for more details. Appmonger is an Android application for Android application sellers. It fetches order data from Google Checkout/Google Wallet and provides up-to-date sales figures and graphical reports, complete with all necessary foreign currency conversions. 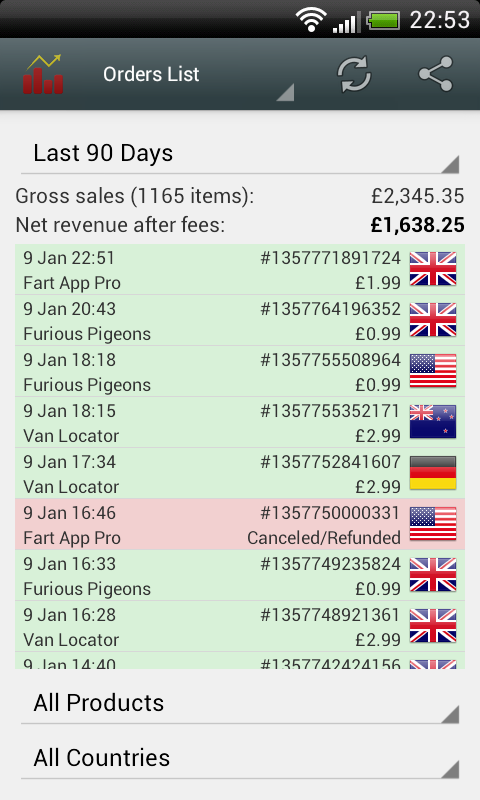 Appmonger allows data to be filtered by time period, product and country. It includes a configurable widget and new order notifications so that you can keep track of your app sales as they happen - wherever you are. Please refer to the FAQ for information about Appmonger's support for buyer's currency transactions and the related order reconciliation feature. Appmonger includes the following charts. All charts can be shared via e-mail, MMS, Bluetooth, Facebook, Flickr or any other application that supports sharing of images. A pie chart displaying revenue share by product. If you sell multiple Android applications this shows you how much money each one makes. This can be filtered by time period and by country so, for example, you can see which of your applications has sold most in Germany this week. A line graph showing the ups and downs of your revenue over time. Filter by product, country and time period. Includes a moving average that smooths out spikes and reveals longer term trends. A line graph showing the total revenue over time. Filter by product, country and time period. A pie chart displaying revenue share by country. Where do you sell most apps? Identify countries where sales could be improved. Filter by product and time period. Do some apps sell better at the weekend than during the week? Find out with this bar chart. Again, you can filter by time period, product and country. This bar chart shows peak sales times during the day. Do you make most of your sales before breakfast? The same filters apply to this chart. Each of the above charts also has a variant that shows the number of units sold as opposed to net revenue. These can be useful, for example, for analysing how changing the price of your app affected the number of copies sold rather than merely the effect on overall revenue. Some apps get refunded. This pie chart shows you what percentage of orders are refunded or declined. A high refund rate might indicate a problem with your app. View orders as a colour-coded list. Filter by time period, country and product. Includes cancelled/declined orders. Different order statuses are shown in different colours. Appmonger includes a widget that allows you to display the current day, week or month's sales figures on your phone's home screen, automatically updated. 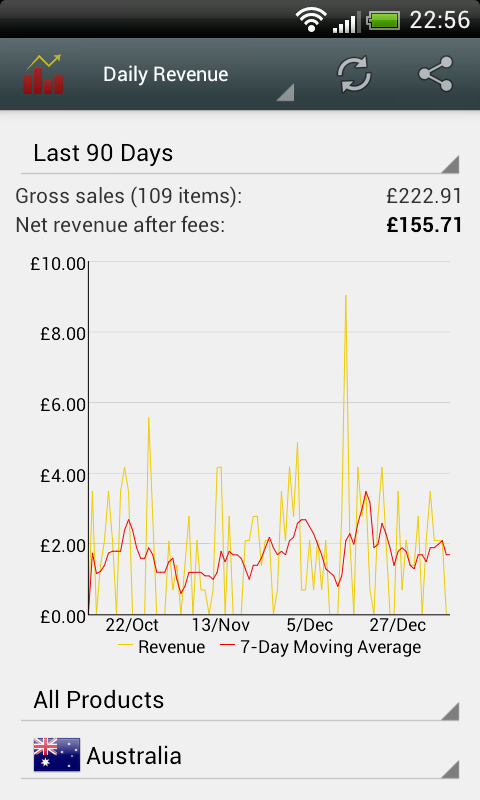 The widget can be configured to display combined sales for all apps or just sales for an individual app. You can display multiple Appmonger widgets on your home screen, so you could have one for each app that you sell, if you've got room. Widgets are updated every time that Appmonger fetches orders data from Google Wallet. You can set the background fetch interval to be as low as 15 minutes or as high as 24 hours, or disable it completely (in which case widgets will only be updated when you manually fetch data). The more frequently Appmonger fetches orders, the more demand it will place on your phone's battery. If you want to view more detailed information, just tap the widget to launch the full Appmonger application. Appmonger can be configured to automatically fetch the latest orders in the background and to display status bar notifications (with optional sound and/or vibration) whenever new orders are received. Appmonger allows you to group different apps together for reporting purposes, which makes things more manageable if you sell dozens of different apps.